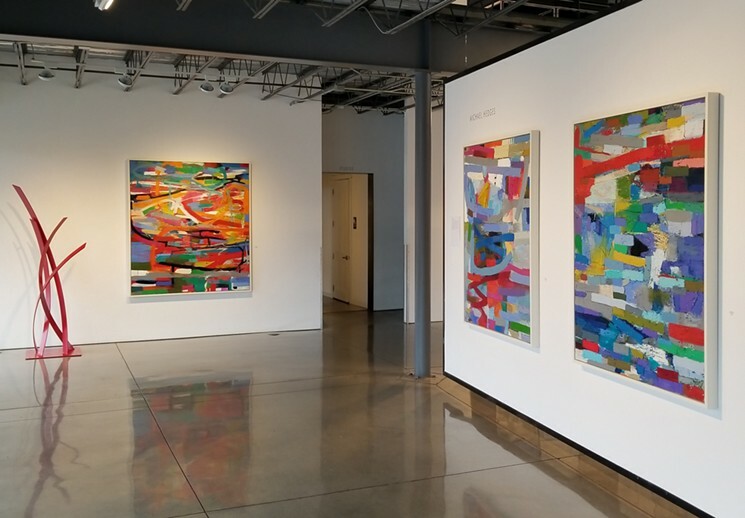 “…Color and form are also the keystones of The Future Is Liquid, a gorgeous group show at Space Gallery with nary a mountain or anything else recognizable, not even if you squint. 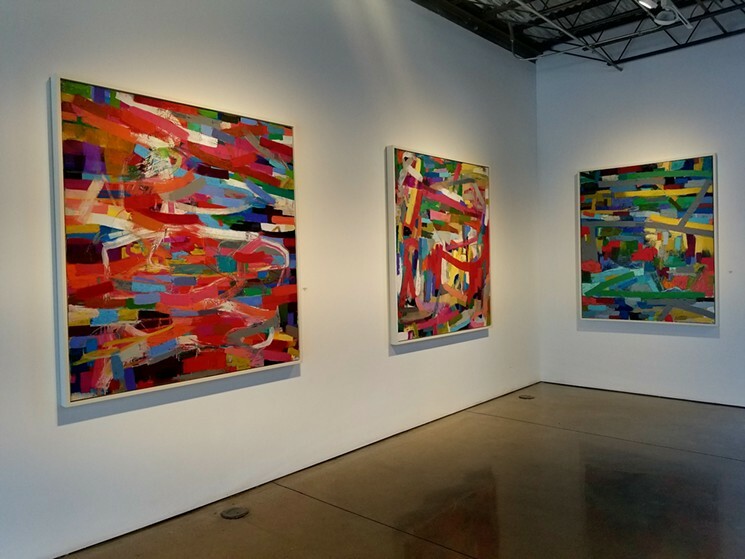 The show starts off with large abstractions by Michael Hedges, with thick bars of paint applied in single strokes by a wide brush loaded with some kind of bright color. Hedges, a Chicago artist, has written that his process involves “great bursts of energy,” and you can see that quality in the paintings, which include a dizzying number of individual marks that have been piled on top of one another, filling the canvas to all four edges. 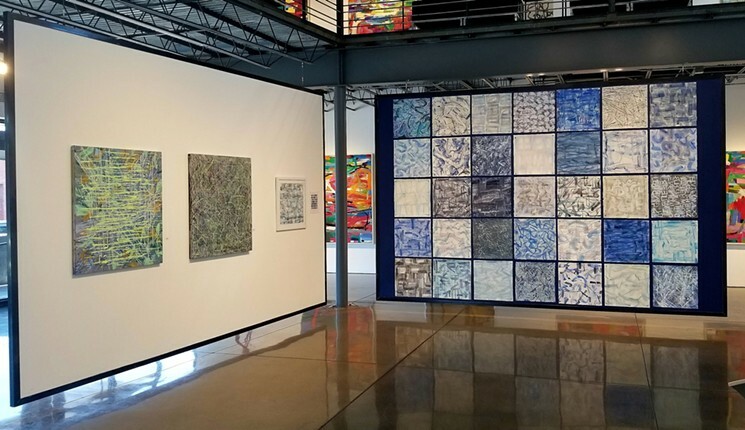 All of the Hedges pieces resonate closely with one another and are intimately interrelated in both their shared palette and their similar composition. This consistency can be partly explained by the fact that Hedges normally works on ten or more paintings at once, presumably applying one color to all the canvases, then another color to all of them, and on and on. No matter how he makes them, though, the results are gorgeous. Space is so roomy that even though Hedges is given only the entry galleries, his many paintings in The Future Is Liquid would constitute a full-blown solo just about anywhere else in town. Monroe Hodder’s many paintings and works on paper could serve as another solo — but it would be the size of a museum show. Hodder maintained a home and studio in Steamboat Springs for many years and is well known in Denver, where she’s shown her work around town. Although she relocated to New York a few years ago, she’s maintained a local presence through exhibits such as this. Ten years ago, a signature Hodder would have been a stack of horizontal bars that were thickly and heavily painted and then overpainted. A few years ago, she broke with this strict formality and began exploring other directions. Her latest turn is using spattered screens of color floating over heavily worked and multi-colored fields, and the paintings are dazzling. In addition to these large pieces, she’s contributed a grid of 49 works on paper with a separate, single painterly gesture on each that lay out the vocabulary of marks that she’s used on the paintings. Scattered throughout the galleries are simple linear sculptures by Oregon’s Miguel Edwards. The three-dimensional scribbles are made of welded steel bars, but despite this heavy material, the resulting works have a lightness dominated by open space within the sculptures. Each has been finished in a striking monochrome color such as red, orange or blue. Sort of a cross between a geometric aesthetic and an expressionist one, the Edwards sculptures work beautifully with the Hedges and Hodder paintings. In the heat of July, these colorful exhibits are the aesthetic equivalents of summer carnivals for the eye. 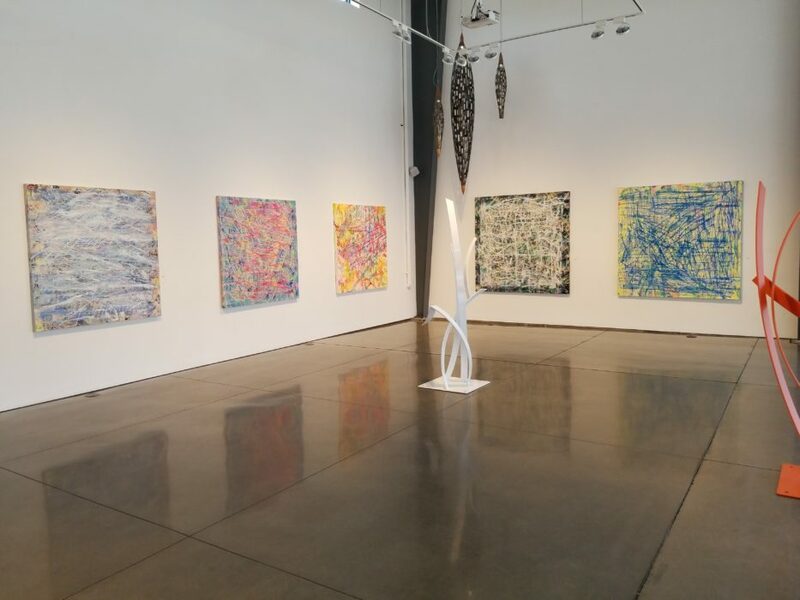 The Future Is Liquid, through August 4, Space Gallery, 400 Santa Fe Drive, 303-993-3321.